Bank Street Toyota is proud to offer only the very best Toyota repair and maintenance service in Ottawa, Ontario. At Bank Street Toyota, we treat your vehicle as if it was one of our own, which means you can expect only top-notch customer service and high-quality work. 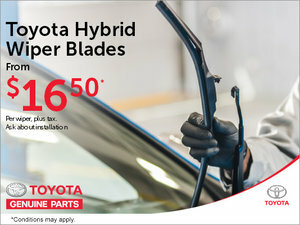 From a simple oil change to more complex repairs, Bank Street Toyota has you covered. Our highly-skilled technicians use only the very best quality tools and equipment, and they have been trained directly by Toyota to ensure they know your vehicle inside and out. Our team of courteous service advisors will make sure you understand the servicing needs of your Toyota, and recommend only the most appropriate repairs and maintenance. As you wait for your vehicle, relax in our modern lounge complete with wireless access, or ask for our efficient shuttle service that will quickly have you back on your way. We also offer exclusive and affordable rates on vehicle rentals. Book your appointment with our repair and maintenance department today through our online form. We will confirm your appointment as soon as we receive your request. You can also contact us directly at 1 855 217-7044.